Title: Early Dual Antiplatelet Therapy for Stroke Prevention? Does using a combination of aspirin and clopidogrel decrease your patient’s risk of recurrent stroke after a minor ischemic stroke or high risk TIA event? The recent international Platelet-Oriented Inhibition in New TIA and Minor Stroke (POINT) trial compared 4881 patients receiving aspirin/clopidogrel vs. aspirin/placebo within 12 hours of symptom onset. Patients who received DAPT had a lower rate of major ischemic events at 90 days compared to aspirin/placebo (5.0% vs. 6.5%, p=0.02). However, patients who received DAPT had a higher rate of major hemorrhage compared to aspirin/placebo (0.9% vs. 0.4%, p=0.02). A similar Chinese study, the Clopidogrel in High-Risk Patients with Acute Nondisabling Cerebrovascular Events (CHANCE) trial, compared 5170 patients receiving DAPT vs. aspirin/placebo within 24 hours also found lower rate of stroke (8.2% vs. 11.7%, p<0.001) but similar rates of moderate/severe hemorrhage (0.3% vs. 0.3%, p=0.73). Major differences between these two trials are the population studied and the duration of DAPT, as POINT utilized DAPT for 90 days while CHANCE utilized DAPT for 21 days. Bottom Line: The use of DAPT in minor ischemic stroke and high risk TIA reduces the risk of recurrent stroke. However, the duration of DAPT may affect the risk of major hemorrhage. Johnston SC, Easton JD, Farrant M, et al. Clopidogrel and aspirin in acute ischemic stroke and high-risk TIA. N Engl J Med2018; 379(3):215-25. Wang Y, Wang Y, Zhao X, et al. Clopidogrel with aspirin in acute minor stroke or transient ischemic attack. N Engl J Med 2013;369(1):11-9. We know that high flow nasal cannula is an option in the management of acute hypoxic respiratory failure without hypercapnea. A newer iteration of high flow, "high velocity nasal insufflation" (HVNI), may be up-and-coming. According to its makers (Vapotherm), it is reported to work mainly by using smaller bore nasal cannulae that deliver the same flows at higher velocities, thereby more rapidly and repeatedly clearing dead space, facilitating gas exchange and potentially offering ventilatory support. Authors concluded that HVNI is noninferior to NPPV for all-comer respiratory failure. The availability of a nasal cannula that helps with CO2 clearance would be great, and an option for patients who can't tolerate the face-mask of NPPV would be even better. HVNI requires more investigation with better studies and external validation before it can really be considered noninferior to NPPV, but it certainly is interesting. Doshi P, Whittle JS, Bublewicz M, et al. High-Velocity Nasal Insufflation in the Treatment of Respiratory Failure: A Randomized Clinical Trial. Ann Emerg Med. 2018;72(1):73-85. Clonidine is an alpha-2 agonist commonly used to treat hypertension. Clonidine can also be used to mitigate symptoms of opioid withdrawal as it easily crosses the blood brain barrier and reduces sympathetic effects. When using clonidine for acute withdrawal or blood pressure control, oral tablets are the preferred route. Clonidine transdermal patches have slow absorption and take 2-3 days for the effect to be seen. Once removed, clonidine patches can provide therapeutic levels for up to 20 hours. Bottom Line: If clonidine is needed acutely for your patient, select oral tablets and titrate to effect. Catapres-TTS [package insert] Boehringer Ingelheim Pharmaceuticals, Inc. Ridgefield, CT, August 2016. Title: Must transverse myelitis be symmetrical? Although transverse myelitis classically presents with bilateral and symmetric symptoms, it may be “partial” - symptoms would be asymmetric, or specific only to particular anatomic tracts. In patients with risk factors (e.g. recent infection, history of autoimmune disease or cancer) and subacute ascending weakness/sensory symptoms, perform a thorough neurological exam, and obtain a gadolinium-enhanced MRI of the entire spine and/or lumbar puncture if you suspect transverse myelitis. Frohman EM, Wingerchuk DM. Clinical practice. Transverse myelitis. N Engl J Med. 2010;363(6):564-572.
de Seze J, Lanctin C, Lebrun C, et al. Idiopathic acute transverse myelitis: application of the recent diagnostic criteria. Neurology. 2005;65(12):1950-1953. 25yo baseball pitcher presents with medial elbow pain. He felt a painful “pop” and could not continue to throw (due to loss of speed and control). Mild paresethesias in 4th and 5th digits. What physical examination maneuvers can you do at the bedside to assist in the diagnosis? Exam opposite elbow first to establish baseline and to assist patient relaxation and understanding. Valgus stress test – flex elbow with forearm/hand supinated. Apply valgus stress test and note for laxity/firm endpoint. Milking maneuver – Here the valgus stress is created by pulling on the patient’s thumb with the forearm supinated and elbow flexed to 90°. Note instability, pain, or apprehension. Originally described a Dr. West in 1841 – it is a rare (~1200 cases annually) seizure disorder in young kids, generally less than 1 year old. Very subtle appearance, often with only bending forward or ‘jerking’ of the extremities as opposed to Brief Resolved Unexplained Event (BRUE) or tonic-clonic in description. The spasms can be thought of as a syndrome, where 70% of those have an undiagnosed rare metabolic/genetic disease. A prompt evaluation, including labs, EEG, MRI, metabolic and genetic studies is vital in helping to establish a diagnosis which can have a profound impact on the patients prognosis. Examples might include Tuberous Sclerosis, Pyridoxine Dependent Seizures among over 50 others. Bottom line: In pediatric patients less than 1 year old who present to the Emergency Department with a description of spasm-like episodes, consider Infantile Spasms on the differential, and consult your friendly neighborhood Pediatric Neurologist for help in determining a proper disposition. Ibuprofen is an effective antipyretic and analgesic and children. In the US, ibuprofen is not used in children less than 6 months due to safety concerns involving adverse GI effects, risk of renal failure, increased risk of necrotizing infections and Rey syndrome. The British National Formulary, however, does provide dosing guidance for infants aged 1-3 months. This study was a retrospective review looking at infant's age less than 6 months who were prescribed ibuprofen or acetaminophen. The rate of adverse GI and renal events were compared between both the ibuprofen and acetaminophen group. GI adverse events were mild including vomiting, moderate with abdominal pain and gastritis. Renal adverse events included acute or chronic renal failure. GI and renal adverse events were not higher in infants younger than 6 months who are prescribed ibuprofen compared to those age 6-12 months. Adverse events were increased in children younger than 6 months to her prescribed Motrin compared to acetaminophen alone. Bottom line: Remain cautious about adverse GI and renal events in children age less than 6 months when using ibuprofen compared to acetaminophen. However, there is no difference in adverse events when ibuprofen is used in children younger than 6 months compared with those older than 6 months. Walsh P, Rothenberg S, Bang H. Safety of ibuprofen and infants younger than 6 months: A retrospective cohort study. PLos ONE 13 (6):e019493. Title: A Bad Natural "High"
Temp 100.3, HR 120, RR 14, BP 130/88. Pulse Ox 98%. Neuro: Extremely agitated pacing, no muscular rigidity. What has he ingested and what is the treatment? 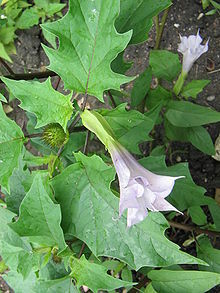 Datura stramonium, aka: Jimson Weed, flowers in the summer with white to violet trumpet petals, green irregular toothed leaves, and a green thorny round walnut sized seed pod (aka: thorn apple) the base of the stem. In the fall, the seed pods turn brown and split open to reveal chambers that are packed with dozens of small black seeds containing the anticholinergic tropane alkaloids, atropine, hyoscyamine, and scopolamine. All parts of the plant are toxic and it has long been used in traditional medicine. Toxicity consists of anticholinergic toxidrome: Delirium and agitation, visual hallucinations, dry flushed skin, hyperthermia, mydriaisis, tachycardia, absent bowel sounds, urinary retention, remembered by the pneumonic "Red as a beet, hot as a hare, dry as a bone, blind as a bat, mad as a hatter, the bowel and bladder lose their tone, and the heart runs alone" . Toxicity is usually 12 hours but can be quite prolonged. -IV Physostigmine, a reversible short acting acetylcholinesterase inhibitor increases acetylcholine at the synaptic clef, crosses the blood brain barrier, and is antidotal. Physostigmine has been demonstrated to be more effective and without significant complications when compared with benzodiazepines for the diagnosis and treatment of anticholinergic agitation and delirium. Usual dose is 0.5-2 mg with repeat dosages as needed. Anticholinergic syndrome induced by toxic plants. Soulaidopoulos S,Sinakos E, et al. World Journal of Emergency Medicine. 2017;8(4):297-301. Anticholinergic delirium following Datura stramonium ingestion:Implications for the Internet age. Vearrier D, Greenberg MI.J Emerg Trauma Shock. 2010;3(3):303. A comparison of physostigmine and benzodiazepines for the treatment of anticholinergic poisoning. Burns MJ, Linden CH, et al. Ann Emerg Med.2000;35(4):374-81. Complications of diagnostic physostigmine administration to emergency department patients. Schneir AB, Offerman SR, et al. Ann Emerg Med. 2003 Jul;42(1):14-9. Providing appropriate analgesia and sedation to mechanically ventilated patients is of paramount importance. In a recent systematic review and meta-analysis, Stephens et al. assessed the impact of deep sedation within the first 48 hours of initiation of mechanical ventilation. In 9 studies that included over 4,500 patients, deep sedation within the first 48 hours of initiation of mechanical ventilation was associated with increased mortality, increased ICU LOS, and increased frequency of delirium. When possible, target lighter levels of sedation in mechanically ventiilated patients. Stephens RJ, et al. Practice patterns and outcomes associated with early sedation depth in mechanically ventilated patients: A systematic review and meta-analysis. Crit Care Med. 2018; 46:471-9. Devlin JW, et al. Clinical Practice Guidelines for the Prevention and Management of Pain, Agitation/Sedation, Delirium, Immobility, and Sleep Disruption in Adult Patients in the ICU. Crit Care Med. 2018; 46:e825-e873. The Centers for Disease Control and Prevention recently released guidelines on the diagnosis and management of mild traumatic brain injury (mTBI**) among children. From 2005-2009, children made almost 3 million ED visits for mTBI. Based on a systemic review of the literature, the guideline includes 19 sets of recommendations on the diagnosis, prognosis, and management/treatment of pediatric mTBI. 3. Assess evidence-based risk factors for prolonged recovery. No single factor is strongly predictive of outcome. 5. Counsel patients to return gradually to non-sports activities after no more than 2-3 days of rest. Diagnosis and management of mild traumatic brain injury in children: A systemic review. Lumba-Brown A, Yeates KO, Sarmiento K, Breiding MJ, Haegerich TM, Gioia GA, Turner M, Benzel EC, Suskuer SJ, Giza CC, Joseph M,Broomand C, Weissa B, Gordon W Wright DW, Moser RS, McAvoy K, Ewing-Cobbs L, Duaime AC, Putukian M, Holhouse B, Paulk D, Wade SL, Herig SA, HalsteadM, Keenan H, Choe M, Christia CW, Gusiewic K, Raksin PB, Gregory A, Mucha A, Taylor HG, Callahan JM, DeWtt J, Collins MW, Kirkwood MW, Ragheb J, Ellenbogen RG, Spinks TJ, Ganiats TG, Sabelhaus LJ, Altenhofen K, Hoffman , Getchius T, Gronseh G,Donnell Z, O'Connor RE, Timmons SD JAMA Pediatr 2018 Sept 4. Analphylatoid reaction is caused by non-IgE mediated histamine released. Intravenous N-acetylcysteine (NAC) infusion is well known to cause analphylatoid reaction. However, it’s incidence is unknown. Recently, a large retrospective study of all patients who received 21-hour IV NAC in 34 Canadian hospitals (1980 to 2005) was performed. Over 90% patients developed analphylatoid reaction within 5 hours. Female, single acute ingestion and low serum acetaminophen levels are associated with incidence of anaphylactoid reaction. Yarema M et al. Anaphylactoid reactions to intravenous N-acetylcysteine during treatment for acetaminophen poisoning. J Med Toxicol 2018: Jun;14(2):120-127. doi: 10.1007/s13181-018-0653-9. Epub 2018 Feb 8. 4.2% is not a standard concentration of bicarb used in the U.S. Consider administration of sodium bicarbonate for your critically ill ED patients with severe metabolic acidosis and AKI, especially if acidosis &/or renal function is not improved with usual initial measures (such as IVF, etc). Jaber S, Paugam C, Futier E, et al. Sodium bicarbonate therapy for patients with severe metabolic acidaemia in the intensive care unit (BICAR-ICU): a multicentre, open-label, randomised controlled, phase 3 trial. Lancet. 2018;392(10141):31-40. Title: Does LR Increase Serum Lactate? Does Lactated Ringer's Raise Serum Lactate? Intravenous fluid administration is a cornerstone of resuscitation and the treatment of many critically ill ED patients. Recent publications have suggested that balanced crystalloid solutions may be better than 0.9% normal saline (NS) for select conditions. Lactated Ringer's (LR) is a common balanced crystalloid solution often used for fluid resuscitation in critically ill patients. AS LR contains approximately 28 mmol/L of sodium lactate, the question of whether LR elevates serum lacate is frequently asked. In a recent small, randomized, double-blind, controlled trial, investigators randomized healthy volunteers to receive 30 ml/kg of either 0.9% NS or LR. The authors report no statistical difference in the mean serum lactate when comparing LR to 0.9% NS. Zitek T, et al. Does intraveneous lactated ringer's solution raise serum lactate? J Emerg Med. 2018; 55:313-8. Many elderly patients have thin skin making suture repair of lacerations difficult. Consider using Steri-Strips™ in combination with sutures to close fragile skin tears. 1. Apply Steri-Strips™ perpendicular to the wound in order to approximate skin edges. 2. Place sutures through both the applied Steri-Strips™ and skin and knot the suture. This technique will help prevent the suture from tearing the skin as the tension of the suture will be distributed across the surface area of the Steri-Strips™. Davis M, Nakhdjevani A, Lidder S. Suture/Steri-Strip Combination for the Management of Lacerations in Thin-Skinned Individuals. The Journal of Emergency Medicine. 2011;40(3):322-323. doi:10.1016/j.jemermed.2010.05.077. The Centers for Medicare and Medicaid Services (CMS) require broad spectrum antibiotics to be administered within 3 hours of presentation of sepsis to be in compliance with the sepsis measure. Not only do the antibiotics that are chosen determine compliance with this measure, but the order in which antibiotics are given can also significantly affect compliance. According to CMS, for combination antibiotic therapy, both antibiotics must be started within the three hours following presentation; however, they do not need to be completely infused within this time frame. Combination therapy typically includes a monotherapy antibiotic (see list in detailed information below) plus vancomycin (daptomycin or linezolid could also be used). So which antibiotic should be given first? If a monotherapy antibiotic is given first within the 3 hours of presentation, then compliance for the sepsis measure is met. These antibiotics cover a broader range of bacteria and are typically infused over ~30 minutes, which allows plenty of time for your second antibiotic to be initiated. If vancomycin is given first, compliance with this measure can become difficult. First, vancomycin has a narrower spectrum of activity and is not a monotherapy antibiotic. Second, vancomycin infusion rates range from 1 to 2 hours. Given that antibiotics are usually given after sepsis is flagged, this infusion rate only gives a short period of time for the second antibiotic to be initiated. Thus, vancomycin should almost always be the second antibiotic infused. In addition, patients may also have limited intravenous access or antibiotics may not be compatible with resuscitation fluids. All of these factors together must be considered when trying to gain compliance with this measure. Administer monotherapy antibiotics (e.g. piperacillin/tazobactam and cefepime) prior to administering vancomycin in your septic patients to improve compliance with the sepsis measure. Specifications Manual for National Hospital Inpatient Quality Measures v5.4. The Joint Commission. https://www.jointcommission.org/specifications_manual_for_national_hospital_inpatient_quality_measures.aspx. Updated December 29, 2017. Accessed August 31, 2018. Title: Pediatric Migraines...what a headache! Migraine diagnosis should only be made after other serious intracranial diagnoses have been ruled out. Avoid opiates and barbiturates. They have not proven to be effective, and have been shown to decrease the effectiveness of future triptan treatments. First line treatment for mild to moderate migraines is acetaminophen and/or NSAID's. The addition of caffeine, has been shown to potentiate the analgesic effects of both. First line treatment for moderate to severe migraines is triptans. Most pediatric migraines presenting to the ED, are severe migraines that have failed the above abortive home treatments and have persisted for 24+ hours. These patients often require intravenous therapy. Dopamine receptor antagonist, specifically Prochlorperazine, 0.15mg/kg, 10mg max, has demonstrated the greatest effectiveness. Consider administration with diphenhydramine, 1mg/kg, 50mg max to prevent dystonic reactions. Concomitant dexamethasone, 0.6mg/kg, 20mg max administration has been shown to decrease acute recurrence. If prochlorperazine fails, other alternatives include Sumatriptan, 5-20mg IN, 50-100mg PO and lidocaine, 0.5mL of 4% solution IN. IVF hydration, and reduction of light and sound stimuli may be helpful. Bachur, R. Comparison of acute treatment regimens for migraine in the emergency department. Pediatrics.2015;135(2)232-238. Gelfand, A. Treatment of pediatric migraine in the emregency department. Ped Neuro.2012;47(4)233-241. Kacperski, J. The optimal management of headaches in chidlren and adolescents. Ther Adv Neuro Disor. 2016;9(1)53-68. Sheridan, D. Pediatric Migraine: Abortive treatment in the emergency department. Headache. 2014;54(2):235-245. A 68 year old male presents to the ED complaining of weakness to his legs. He states today his yard chores took him over 2 hours to complete instead of the usual 15-20 minutes due need to take frequent breaks for rest due to leg pain. He denied any chest pain or shortness of breath. Past medical history included hypercholesteremia, HTN, and CAD. He is taking aspirin and recently started on rosuvastatin. His physical exam was unremarkable. Results showed normal EKG and CBC. Bun was 70, Creatinine was 3.4, and CPK of 1025. This patient has statin induced rhabdomyolysis and acute renal failure. Rhabdomyolysis is characterized by muscle necrosis which causes the release of myoglobin into the bloodstream. Clinical manifestations can range from asymptomatic elevation of CPK to life-threatening cases with extremely high CPK levels, electrolyte imbalance, and acute renal failure. Classic triad is: muscle aches and pains, weakness, and tea-colored urine. Numerous recreational drugs, pharmaceuticals, and toxins can alter myocyte function. Ethanol, statins, and cocaine in particular have high risk to cause rhabdomyolysis. 50% of cases of statin-induced-rhabdomyolysis were due to drug interactions. A reappraisal of risks and benfits of treating to target with cholesterol lowering drugs. Alla VM, et al. Drugs. 2913 Jul; 73 (10) :1025-54. Malignant drug-induced rhabdomyolysis. Gheshlaghi F. J Nephropathology. 2012; 1(1): 59-60. Nontraumatic drug induced thabdomyolysis: Background,laboratory features, and acute clinical management. Köppel, C. Med Toxicol Adverse Drug Exp (1989) 4: 108. Title: Does larger initial naloxone dose (IV) lead to longer duration of opioid reversal? Various intial doses of naloxone (0.4 to 2 mg) are administered to reverse the signs and symptoms of opioid toxicity. However, there is limited data regarding the duration of action of naloxone is correlated to the administered dose. A recently published retrospective study investigated whether initial naloxone doses (IV), low-dose (0.4 mg) vs. high-dose (1-2 mg), lead to different time to recurrence of opioid toxicity. Study sample: 274 patient screened but 84 patients were included. Higher rate of adverse effects (withdrawal symptoms - vomiting, agitation, tachycardia, etc.) were observed in high-dose group (41% vs. 31%) but this was not statistically signficant. High-dose naloxone (1 - 2 mg) does not result in longer duration of reversal of opioid toxicity. Duration of opioid toxicity reversal by naloxone administration were similar to previously reported duration of action of naloxone (30 to 90 min). Note: there are several lmitations to the study study including retrospective design - documentation issues, small sample size, patient selection - patients were included if positive response to naloxone was observed, unknown opioid exposure, variable dosing in high-dose group (1 to 2 mg vs. 0.4 mg) and naloxone was given via IV only.